Spring is Here. Time to Think About Field Day. Field day is rapidly approaching. We have some suggestions to make your set up easier, your operating smoother, more QSO�s, and a higher score. PWRgates provide uninterrupted power for your ham station....not even a glitch when the ac power goes out. Great for Field Day too! When the generator is switched off for re-fueling, all radios continue to work. PWRgates are OR-gates rated at 40 amperes. Inputs are your 13.8 volt power supply and a lead-acid battery. The higher voltage feeds the output. If the power supply cuts out, the battery instantly (at the speed of electrons) drives the radio. When the power supply comes on again it feeds the radio. The power supply charges the battery at all times, keeping it ready for the next power outage. Our SuperPWRgate, model PG40S, includes a battery charger that can be set to 1, 4, 7, or 10 ampere rate. It charges automatically, cycling through a bad-battery check, a high current charge, a peak voltage "absorption" charge, and a constant voltage "float" charge. Our standard PWRgate, model PG40, includes a simple float charging circuit that provides, up to 1 ampere for a drained battery, and tapers off to keep it charged at 13.6 volts. Place a PWRgate and a battery at each Field Day station....NO DOWN TIME during generator maintenance. No glitches. No re-setting radios. More QSO�s. West Mountain Radio also carries GELLED Cell and AGM batteries that are drop shipped to your home by the manufacturer. DC power strips are the convenient way to hook up all your 12 volt radios and accessories. Field day installations are a breeze. Just plug in your radios. Move them easily from one station to another. We make four RIGrunner models; all use Anderson Powerpole® and all inputs and outputs are fused. LED�s light up behind a blown fuse. They come with a 6 ft input cord, and a packet of connectors. Our model 4012 has 12 outputs and our Model 4008 has 8 outputs. They both have LED�s to show high, correct, and low voltage as well as a buzzer to warn you of either high or low voltages. Our model 4005 has 5 outputs. Nice for Field Day, portable, and mobile installations too. The model 4010S has 10 outputs as well as all the features of the other units. However, it has an on-off-auto switch controlling a pass FET. In the auto mode, the radio plugged into output 1 controls all other 9 outputs. All units plugged into positions 2 through 9 will come on when the main radio is turned on. This is a great feature for the ham shack. Some have complained that Powerpole® unplug too easily. They can fall out especially in a car. We now have retainer kits that fit all our RIGrunner models. The kit consists of two end brackets and a rod. The rod slides into each Powerpole® from both end brackets. The rod must be removed to unplug a connection. All our 12 volt power products use Anderson Powerpole®. These fine connectors, used by ARES RACES and commercial emergency services, are rated for 40 amperes but can actually handle considerably more current. Installed properly, they are color-coded, uni-polar, genderless, and cannot be connected in reverse polarity. Best of all they can be installed easily and professionally with our PWRcrimp tool. Get prepared for Field Day. Place Powerpole® on the equipment you are taking there. 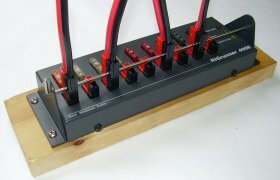 The PWRcrimp tool works with 15, 30, and 45 Ampere Powerpole®. Just place the connector pin in the holder, shove the wire into the connector, squeeze the handle. It ratchets through till the end is reached, releasing and opening the handles. The crimp is precise and sturdy. Just shove the pin with wire into the black or red housing until it clicks. Connector done! Test the true capacity of ANY type of battery: up to 48 volts, 0 to 40 amps or up to 150 watts, whichever is higher with our CBA II. Our new CBA Mark II has 12 bit resolution below 3 amps making it possible to test small batteries as well as very large batteries. Anything from a lithium coin cell to a lead acid repeater backup battery. Graphs may be displayed, saved, printed and compared. Graphically "see" battery "personality" and performance. Data may also be exported, in .TXT or .CSV format, for use in Spreadsheet programs such as Microsoft Excel ®. Temperature reading and auto over-temperature cutoff with the optional temperature probe. The CBA is a "must have" tool for any ham that uses batteries. For the first time and for a reasonable price, anyone can easily perform and interpret scientific tests of their batteries. Digital modes are very popular, and you get twice the point per Field Day contact. You get extra credits for operating SSTV too. PSK 31, RTTY, and SSTV are very easy to set up and operate using our RIGblasters, computer, and excellent software programs. They come with everything needed to get on the air, cables, power supply, and a CD with over 100 programs. Try "Voice Keying" for more consistent Phone QSO�s during Field Day. Just load in a CQ message and a response message, and then QSO with the function keys. This is easy to set up using many software programs and the RIGblaster pro and RIGblaster Plus models. QSO rates go up. RIGblaster pro: - $249.95 Does all digital modes, CW and RTTY. Also has rig control. Used with most contesting programs allows logging the frequency and mode for each QSO. Great for Field Day....no mistakes. RIGblaster Plus: - $139.95 Does all digital modes, CW and/or RTTY. Easy connection for Field Day. RIGblaster nomic: - $59.95 Great for all digital modes. Portable, no power needed. Look for us at N1EV, The Greater Norwalk Amateur Radio Club, on Field Day. change the Subject line to ADD ME TO THE RC HOBBY EMAIL LIST or REMOVE ME FROM ALL FROM EMAIL LISTS.